From the early 1800s through the late 1920s, Marienbad was one of the world's most exclusive thermal spring spas. It attracted royalty and aristocrats plus titans of music and literature. Although Marienbad gradually fell into disrepair in the ensuing years, many of its pastel-hued Baroque buildings have been restored in the last couple of decades. 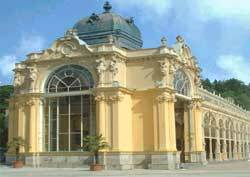 Marienbad sits in a pleasant valley surrounded on three sides by pine forested hills. Several dozen mineral springs dot the area. They are warmed by subterranean volcanic activity. The local mineral spring waters help cure a long list of diseases (say the spa operators). Some charming old fashioned spa hotels are still around (Nove Lazne is the most famous). Spa treatments are available, including thermal, mud, and carbon dioxide gas baths. Visitors come to the main colonnade (see photo) to drink the mineral water out of a small, spouted porcelain cup used exclusively for that liquid.